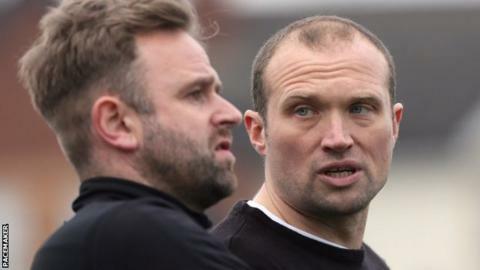 Ards boss Warren Feeney has criticised the decision to allow fellow relegation battlers Newry City's match to kick off later than his team's on Saturday. Newry moved three points above Ards at the bottom after a 4-2 win away to Warrenpoint Town in a match which started after Feeney's side drew with Glentoran. "I just don't get it," Feeney said after Ards' 1-1 draw in Bangor. "I've never heard anything like it in my 22 years in football. "Especially so given the situation that we and Newry are in. We're fighting for our lives and, when it comes to a split, it should all be on even par." The Northern Ireland Football League rules state that a home team can request a change to the kick-off time of a match as long as they do so four weeks in advance of the date. Ards were one point behind Newry going into Saturday's games after losing 3-0 away to Darren Mullen's men in the previous round of fixtures. The North Down outfit temporarily went level with them on points - and ahead on goal difference - after their draw with the Glens, which kicked off at 15:00 BST. However, Newry's derby away to Warrenpoint Town had a 17:30 kick-off and City's victory took them three points ahead of Ards with three league games remaining. "They said the late kick-off was to get more of a crowd - but if you don't want to go to a football game then don't go to a football game," Feeney continued. "I know people will say I am making excuses, but I honestly just do not get it. This tops it off for me." The roles for the clubs will be reversed this week with Newry playing Glentoran at home on Friday night and Ards travelling to Institute on Saturday.